#smallstories On the ice again today: 3 hours, 10+ miles, 4 fisherpeople, 6 skaters. @GeoffreyGevalt wow! I can’t help feel nervous that one of those cracks might go through- no matter what the weight. 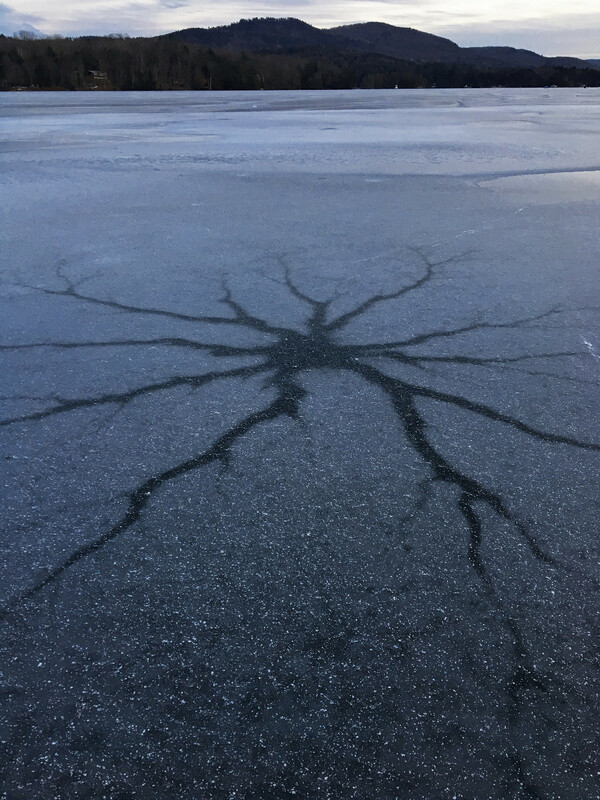 Please tell me someone checks the thickness of the ice before people put their skates on. @tellio a #smallstories sprouts a #smallpoems. LOVE it! thanks so much. To me, a piece of creativity that is "sprouted" from someone else&apos;s writing is the highest form of engagement & affirmation. Peace. @GeoffreyGevalt Amen. That is the ethic that @dogtrax and I have been practicing for years. I am glad you are as receptive. @tellio @dogtrax absolutely. On the sites I made for the kids (https://youngwritersproject.org) and make for the teachers (https://ywpvt.org) there is a feature I developed that allows users to sprout off someone else’s post and forever the two are linked. It becomes part of the pedagogy of reciprocal response. @GeoffreyGevalt @tellio I always loved that idea of "sprouting" off as remix riff from the original post, connected together. @dogtrax @GeoffreyGevalt Been watching a bunch of YouTube vids about growing oyster mushrooms. These little sprouts are always a sign of a healthy crop a comin&apos;. That would make the original post, the mycellium. Or perhaps if you trace back, the post would be the spore. However you look at it, that&apos;s one big mycorrhizal mess. Yes? #smallstories response. @tellio @dogtrax love this analogy. It had not occurred to me. Which, I think, is the definition of engaging expression, that you are presented with a new idea, that it awakens an unused path of synapses and takes you to places not before traveled. Active listening might be another way of putting it. Reactive writing may be another. We talk these days of "derivative" works. While most stories derive from Shakespeare it seems, there is nothing wrong with re-interpreting, re-creating. It is human. @dogtrax @tellio So, Dog, wouldn&apos;t it be fun to experiment with your kiddos, to purposefully train, coax, encourage them to "sprout" off each other&apos;s ideas and learn how to recognize when ideas pop up in their brains? As the New Year begins, give some thought to a site for your kiddos. Happy to do it and happy to provide you support. You, of all people I know, could do wonders with it. Let me know. @GeoffreyGevalt This reminds me happily of living in Maine and taking my kiddo skating on ponds. It was a time which felt like "no matter what happens in the future, I'm glad I was able to give her this." @compostablespork you gave your child something wonderful. I had the good fortune, when my kids were little and lived at home, of having a clear day, clear lake and wicked nice wind. So I took a tarp and after pushing the head wind across the lake, I rigged the tarp as a sail and we flew back, a chain of humans hanging onto Dad. I can still hear their laughter. When my kids were little we read a book called The Big Big Sea, about a little girl and her mum who go down to the beach in moonlight and splash in the waves. It was so close to our own lives by the sea. @katebowles @compostablespork what a delightful story. thanks so much for sharing this. Was not familiar with the book. As someone who lived inland for most of my life, I find the story particularly appealing.